May is the most magnificent month of the year, eagerly awaited by all hopaholics who crave a different hop fix, because it’s the time that all the wet hop beers begin to arrive on the shelves at Fresh Choice Nelson. 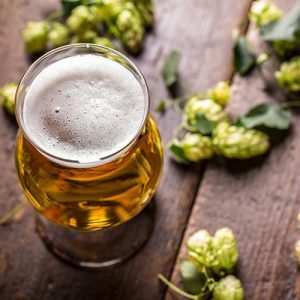 They’re not called wet hop beers because of the drooling and salivating we do as we think about guzzling them; they’re called wet because they’re not dried. Wet hopped, fresh hopped, green hopped or seasonal harvest; it doesn’t matter, they’re all hops picked from the hop bine then thrown straight into the brew kettle. Normally these plump, resinous, green munchkins are despatched to a kiln and dried soon as to preserve their rapidly deteriorating volatile oils and aromas. As for the unique taste in the wet hopped beer, well that’s like the difference between cooking with fresh herbs or with dried herbs. Not a stronger tasting hop flavour, but a fresher, greener flavour with softer, fuller bitterness that starts at the front and continues on down. And like grapes, the hop cone can differ year to year in flavour qualities. A fantastic example of fresh hops and how annual hop variations can change the flavour profile is the latest Sprig & Fern Harvest Pilsner… Perhaps a crisper example than last year’s pilly, with a sharper hop note combining so well with the pilsner malts. Behemoth Cheech & Chong Fresh Hop IPA 6.5% – Great name for a great hopped beer. Peaches dominate with a smooth mouthfeel that makes this one of the easiest 6.5%-ers out there. Eagle Brewing South Island Pale Ale Fresh Hop 5.5% – Flavours of strawberries, apricots and onions. Citrus finish and very quaffable. Vasta Farian Green Hopped IPA from Tuatara – The Riwaka fresh hops impart flavours of mangos, passionfruit and hop stalks finishing with peppery biscuit malts and lingering bitterness. Carl Vasta is the founder of Tuatara. All of these wet hop beers are beer today and gone tomorrow, as fresh hops are totally seasonal. So head down to Fresh Choice Nelson to pick up yours!